* Before the season, ABS FC signed several players from Abia Warriors FC, including goalkeeper David Walbe, midfielder Kingsley Onovo and enterprising striker Andrew Abalogu. All three players have made an impression at the club and they have recently been joined by their former teammate Bright Esieme, who is a defender. * Captain Ejindu scored four league goals for Dolphins FC during the Nigeria Premier League 2010-2011. The striker has recently joined Enyimba FC. * Kaduna United FC has strengthened their defence by signing David Amanyi (born 31.12.1984) from Enyimba FC and Peter Emuobo Ambrose (born 23.12.1989), last seen at Heartland FC. Amrose is the younger brother of Efe Ambrose from MS Ashdod (Israel). 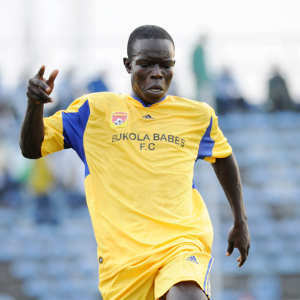 * Azubuike Okey of Niger Tornadoes FC is a player to watch. The defensive midfielder is currently part of the Nigeria U-17 national football team. * In December 2009, striker Son Hingir was voted as the “Best rookie” of the Nigeria Premier League 2009-2010. Due to discipline problems, Hingir disappeared from the football scene until a week ago, when he scored his first goal for Niger Tornadoes FC against Enyimba FC. Hingir faces tough competition for a place in the starting eleven as Sibi Gwar (born 06.09.1987) is preferred as the centre-forward with Daniel Essien Etor (born 05.05.1992) as a support striker. Both players are in great form. Etor has scored 2 goals and Gwar 5 goals so far this season. The picture is of Etor and is taken from danieletor.blogspot.com. * Ocean Boys FC has a new interesting player who I am struggling to find information about. His first name is obviously “Raphael” but his last name has been written six different ways (! ): “Onnarebe”, “Nwerede”, “Owerede”, “Iwerebe”, “Iwerede” and “Oworide”. This “mysterious” player has scored three league goals for Ocean Boys FC during February and March 2012. * Efe Yarhere is a great signing by Rangers International FC. Yarhere is an experienced and powerful centre-forward who scored regularly for Warri Wolves FC. Yarhere has been described as a hard working player who is strong on the ball and full of running. Yarhere has scored two goals since joining Rangers earlier this month. * Rising Stars FC has signed a striker called Chukwuma Ukuta (born 12.10.1990) from Gabros International FC. * I have recently seen some match reports, suggesting that Gift Atulewa (born 01.04.1986) of Warri Wolves FC is in top form at the moment. Atulewa has one of the best left-feet in the league and he is simply deadly from free-kicks and set-pieces. Atulewa is primarily an attacking midfielder. Atulewa, a former player of Bayelsa United FC, is currently playing his fourth season for Warri Wolves FC. At the time of writing, Atulewa has scored two league goals during the Nigeria Premier League 2012. 186 centimeters, good aerially and uses both legs well. In February 2012, Amutu was named in the squad of the Nigeria U-17 national football team. Amutu will be hoping to partner star striker Jude Aneke (born 07.01.1989) up front. Aneke has only scored three goals so far this season and could obviously need some support. Warri Wolves FC recently signed striker Azuka Ebinum, who scored five goals for Niger Tornadoes FC in the early parts of the season, to share the scoring responsibilities at the club. * Nehemiah Ekong was a key performer for Crown FC during the Nigeria Premier League 2010-2011. The versatile defender / midfielder is currently playing for Wikki Tourists FC. * In December 2011, Mustapha Ibrahim of Wikki Tourists FC was training with the Nigeria B national football team. Ibrahim has scored two league goals in March 2012. I am not sure who this player is but a midfielder called “Mustapha Ibrahim” (born 13.12.1990) was part of the Nigeria U-17 national football team during the 2007 FIFA U-17 World Cup.